Home » Category "Fabric Cutting"
Before sewing, you have to cut fabrics parts by parts according to measurement and sewing allowance. The function of cutting fabrics in accordance with the sewing allowance and required measurements are done by the cutting section of the garments. Cutting is the first step basically we may find in garments making. When cutting started we can say that garments production is also started that means starting cutting also indicates the starting of production. 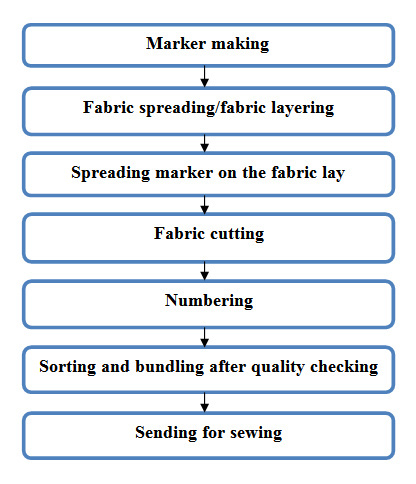 Flow chart of garments cutting section is the interrelated sequence of the following. 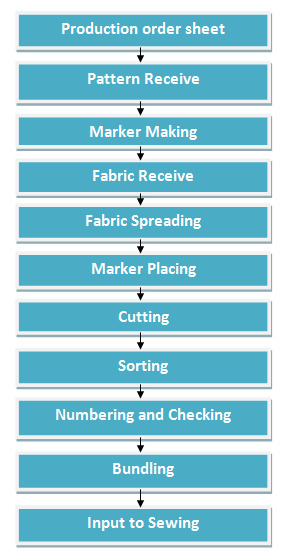 Production order sheet => Pattern receive => Marker making => Fabric receive => Fabric spreading => Marker placing => Cutting => Sorting => Numbering and checking => Bundling => and finally Input to sewing. Keep in mind that as the fabrics cutting is one of the crucial parts of the production you have to be more careful to ensure proper measurement. If you cut the fabrics into the wrong measurement then the production garment will be considered as defected items because you will be failed to produce according to the specified size or shape. It is a quality control department to check whether every process is maintained in a right way.